Putting your best face forward is easy if you have the best lighted makeup mirror. A lighted mirror helps you see every angle of your face in proper lighting so you can take better care of your skin and enjoy easier makeup application. We’ve found the best lighted makeup mirrors for you to choose from. These 10 lighted makeup mirrors are sure to help you see your face in a whole new light! 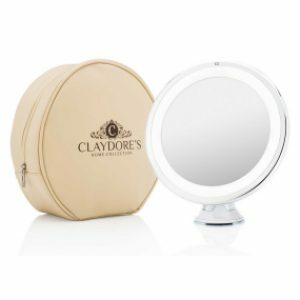 If you’re always on the go, Claydore’s wireless mirror is a brilliant option. It is touch-activated with an LED light that is bright enough yet provides a soft diffused glow, allowing you to see your face clearly. It magnifies up to 7X, making tweezing your eyebrows and examining your pores easy. This mirror never fogs up either so you can easily apply makeup right after showering! Plus, it requires no cords. It runs on AAA batteries which allows you the freedom to use it anywhere you are. The super strong suction cups grip firmly to bathroom mirrors, glass, marble, and acrylic. It also tilts and swivels 360 degrees so you can see your face at any angle. Additionally, it comes with a padded zippered travel bag that has an elegant look to it. By storing it in the bag, you can travel without worries that your mirror will stay safe. This lighted makeup mirror is a fantastic option for many reasons. For one, it’s cordless. While you will need to supply your own batteries (they aren’t included), they are easy enough to find anywhere. The one-touch activation makes it simple to turn on. Plus, it can be manipulated to any angle for your viewing ease. The gentle lighting that it emits is bright enough to see your face in the right light, and the suction cups keep it in place. With the travel bag, it makes it easy to take it anywhere so if you’re someone who travels frequently, you’ll love it. 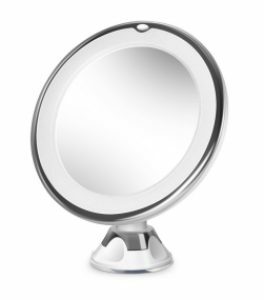 Conair’s distinguished-looking mirror features 2 sides so that you can see your face perfectly every time. One side offers 7X magnification while the other side offers 1X magnification. It’s flexible so you can adjust it for any angle. The light is soft with an incandescent glow to help you achieve makeup perfection. It’s also a fog-free mirror. The stylish finish of polished chrome looks great with any décor. It plugs in anywhere you want to apply your makeup. Having two sides to a makeup mirror is a great option. Additionally, it’s nice to not worry about batteries. 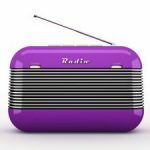 However, some people will find that difficult if their home setup doesn’t have an outlet handy where they like to apply makeup. For those that want to travel with the makeup mirror, this might not be the best option, but for those who are happy to stay put, it provides plenty of versatility and style so you can apply your makeup effortlessly. Miusco’s mirror is stylish with a brushed steel finish, plus it’s adjustable and provides LED light for a natural glow on both sides of the mirror. One side features a magnification of 7X while the other side features 1X. With an 8-inch diameter, it’s plenty big to see your whole face. This is also the thinnest distortion-free mirror on the market. You can choose to plug it in or opt for battery power with 4 AA batteries instead, making it a versatile mirror option. The versatility of this mirror is fantastic. You can plug it in or run it on batteries, which are not included. With two sides, it makes seeing your face up close an easy task so you can apply your makeup and skincare without fail. Fancii presents this mirror with an LED light that provides natural daylight glow. With 10X magnification, you can see more of your face than you ever thought possible. Locking suction cups keep it attached to any surface securely including ceramic, acrylic, marble, enamel, porcelain, and other mirrors too. It affords you a view from every angle with 360-degree rotation, and it can go with you anywhere. Fancii’s mirror is cordless and portable. You can fold it up to a compact size and safely stow it in the included travel pouch. Additionally, it comes with a 100% money back guarantee should you not be happy with it. This mirror is ideal for anyone who doesn’t like to stay put. While the mirror itself will affix to just about any surface, you can pack it up and take it along on any adventure. It runs on batteries which aren’t included, however, are easy to get. 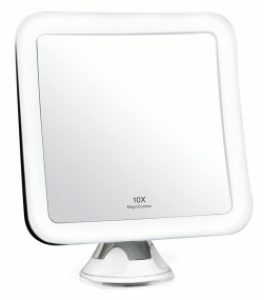 With 10X magnification, it’s one of the most powerful lighted makeup mirrors on the market. Herwiss presents thismirror with LED lighting perfection and 10X magnification so you can see every detail of your face. The LED lighting gives off a natural light that will last for as many as 10,000 hours. It won’t waste power either with an auto shut off, and the touch sensors make it easy to turn it on. 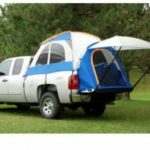 The tri-fold design rotates 180 degrees and can be folded to take with you anywhere you go. Battery operation adds to the portability plus you can opt to connect it to the USB port for more energy efficiency. It comes with a 30-day money back guarantee too in case you’re not satisfied with it. Some women find the tri-fold design a better match for them than the other makeup mirror options. This one gives you 10X the magnification and versatile options for powering it. Plus, it folds up for easy travel, making it ideal for the woman who goes everywhere. Get precision makeup application with Beautural’s makeup mirror. The circular LED light gives off a natural white light so you can see true colors without any shadows. The angle is adjustable for a full 360 degrees so you can see your face all the way. Suction cups provide secure mounting to any smooth and flat surface, including other mirrors. Magnification is 10X so you can get right down to the last detail without flaw. Take it anywhere too – it’s powered by 3 AAA batteries. 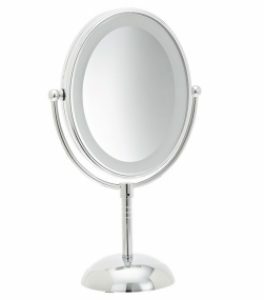 A simple yet effective makeup mirror, the intense magnification makes it easy to see it all. With the circular lighting, there are no shadows cast upon your face so you can apply makeup with confidence. Because of its compact size and battery operation (batteries not included) you can take it anywhere too. 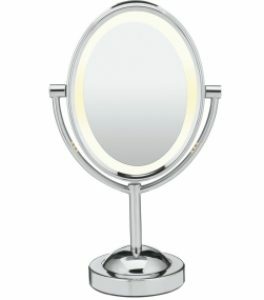 Terresa’s lighted makeup mirror features an acrylic stand that allows you to rotate to any angle with ease. 10X the magnification allows you to zoom right in on any part of your face. It’s cordless and lightweight too, making it an ideal travel companion for the busy jet-setting woman. Applying makeup or skincare products has never been easier too, with the 14-piece LED that illuminates your face for precision makeup application. 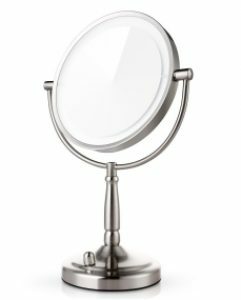 This makeup mirror offers versatility, style, and intense magnification. With gentle lighting that shines bright enough to make any makeup application task a breeze, it can also go anywhere that you do thanks to its compact size and 3 AAA battery power (batteries not included). Bestope’s 21-piece LED mirror is adjustable to make makeup application easy even in dimly lit areas. Touch sensors allow for easy powering, plus the 3 panels with wide-angle allow you precision views and 3X magnification. It rotates 180 degrees from its perch on your countertop and can be adjusted with ease to see it all. You can opt to charge it via USB or AAA battery power too. With the folding design, that means you can take it along anywhere to always look your best. The 21-piece LED light makes short work of makeup application in dim settings, and along with the easy portability of this tri-fold design, you can comfortably do your makeup anywhere. 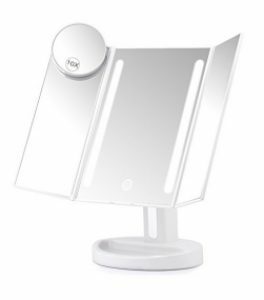 The USB cord is included however batteries are not but it is nice to know that you could sit in the back of a car at night and get your makeup applied perfectly using this lighted makeup mirror. 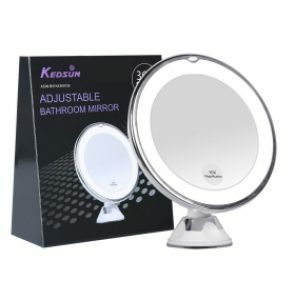 Kedsum’s mirror gives you a natural LED light source with 10X the magnification. It rotates to every angle for 360 degrees of viewing. The locking suction cups stay put, keeping this mirror firmly in place. This mirror is cordless and portable. All you need are 3 AAA batteries to power it up. It folds up and is lightweight in design making it easy to take with you on trips. The precise viewing power and lighting combination gives you everything you need to apply your makeup expertly. 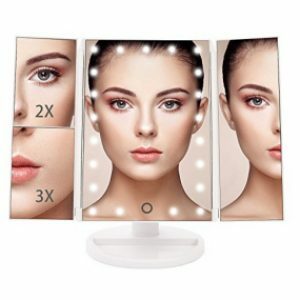 With a powerful magnification and 14 bright LED lights for a natural glow, this makeup mirror gives you everything you need to get your makeup on right. Plus, it’s highly portable, making it the perfect travel companion for vacations or business trips. Conair’s makeup mirror gives you LED lighting that promises to last a lifetime. You’ll never have to replace it, making it an energy efficient option. The mirror is double sided with one side giving 7X magnification while the other side provides 1X magnification. It rotates 360 degrees giving you a great angle all the way around. The elegant design is oval shaped and the polished chrome finish looks lovely anywhere. It is battery operated with 3 AA batteries and features settings of high, low and off on the base. Conair’s quality mirror is a great choice for those who want the flexibility of being able to move their mirror anywhere in their home or take it along. The double-sided design allows for different magnifications to make it easy to tweeze or apply makeup precisely without difficulty. Batteries are not included. Each of these makeup mirrors could easily qualify as the best lighted makeup mirror. However, much depends on your personal needs. If you travel frequently, choosing one that is lightweight, portable and battery-powered is ideal. We really like the versatile option with the models that provide USB power as well as battery power because choices are everything! 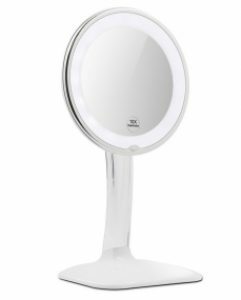 Whichever lighted makeup mirror you choose from this list though, you’ll be making it easier to apply your skincare and makeup products flawlessly.